Dare to Be...and Save on Apparel April 25-27. 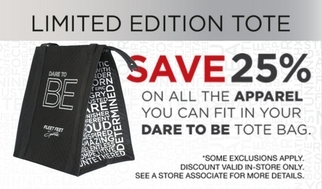 Home › Latest News › Dare to Be...and Save on Apparel April 25-27. Back by popular demand, we got our hands on a fresh pile of tote bags. If you did not purchase on back in November, now is your chance! Dig out your bag, or pick up one up in store (Bags are $10!) Save on apparel April 25-27. Limited edition. Available while supplies last. Click here to reserve your bag!